Summary of today’s show: Catholic early education centers are the latest trend in Catholic schools, serving children from 33 months old right up to Kindergarten. 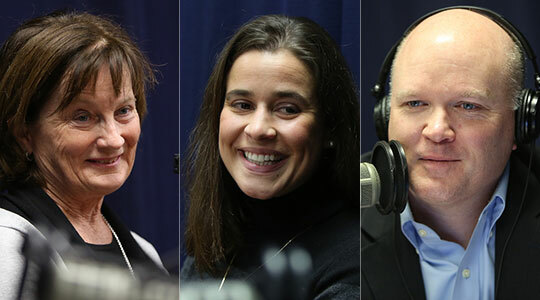 Scot Landry sits down with Nicolette Clifford and Pat Lombard from Good Shepherd School in Charlestown, which got its start in 2009 at St. Mary-St. Catherine of Siena Parish. They discuss Handwriting Without Tears program, TURKS math, and how they incorporate faith formation and serve the various families of the community. 1st segment: Scot Landry welcomed everyone to the show and mentioned that a trend in Catholic education is the growth of Catholic preschool programs. Today, we’re profiling The Good Shepherd School (GSS) is located in the newly renovated ground floor of St. Mary-St. Catherine of Siena in Charlestown. GSS is an independent Catholic school committed to comprehensive, developmentally appropriate programs that strengthen the school-family partnership and enrich the lives and learning experiences of children. Good Shepherd School students are given the opportunity to work collaboratively and explore friendships but also be nurtured within their individual interests in a structured yet multisensory learning environment. Enrichment activities include Spanish, gym, religious education and music classes. Scot welcomed Nicolette Clifford and Pat Lombard to the show. He said the school was started in 2009. Nicolette said Fr. Ronan said he saw interest in the school in the community and formed the school with a board from the community. They have four classrooms with 70 children now. Scot said a freestanding pre-school is unusual. Nicolette said 95% of their families live in Charlestown, with a few in the North End and one in Cambridge. She said these are the most formative years for children to have a positive experience in school. She said it’s a preschool, not a daycare. They have a handwriting program which even the youngest children use. They help children learn in all different ways, not just by sitting at a table practicing letters. You don’t get academic experiences in daycare. Scot asked what the goal is when they start at 3 and end by the time they enter kindergarten. Nicolette said they first want them to have a positive experience of school and forming friendships, then start academic experience. At four or five, they want them to be forming words and writing. They discussed their activities within Charlestown where the children interact with seniors and veterans. Pat said she’s a native of Charlestown. Scot discussed how Charlestown has a mix of people from all the different communities within the community. Pat said she taught in public schools and retired from there before coming back to Good Shepherd. She said it’s a joy to see all the children when she’s out and about town. Pat used to teach 2nd and 3rd grades in public school and now she’s teaching 3 and 4 year olds and they discussed the differences, such as trying to keep their attention and helping them to be good listeners. Nicolette talked about the scheduled, which has three different day lengths ending at noon, 3pm, and 5:30pm, but most get picked up at one of the two earlier times. She said was always interested in education from when she was a small child. She majored in education in college and got a Master’s in early childhood education. They discussed that the school after four years now has a waiting list for students to enter the school. Nicolette said it’s a good kind of stress to have to find spaces. She said there are some early childhood settings within the Boston Public Schools as well as daycares like Bright Horizons. 2nd segment: Scot said it’s a beautiful school in the basement of one of the most beautiful churches in the Archdiocese. Nicolette said people are amazed that being in the basement doesn’t mean it’s gloomy, but they have beautiful stained glass windows. They have religious education on Wednesdays by Sr. Nancy, who rotates through each classroom through the day. On Fridays, the whole school comes together in the chapel for prayer. Outside of those times, there’s a lot of talking to the school about respect for others and helping others, breaking it down to their level. Scot asked about the TURK math program. Pat said the program is setup for K through 8, but they are adapting the material for the young age level, which gives the kids a head start when they reach kindergarten. Her class is concentrating right now on sorting skills. Scot asked if it’s difficult teaching handwriting and dexterity with your hands. Nicolette said they have had nothing but positive experiences with Handwriting Without Tears. She has heard from parents about children wanting to write at home. The children learn in various ways, whether air writing or using various tools. The kids learn from the very beginning, like how to hold a pencil and where to start writing on a page. They hope that at the end the children understand the letters and their goal is for them to be able to write their names by the time they leave. But if they can’t, it’s not a big deal. They’ll eventually learn. They have a Spanish enrichment program, that exposes children to language at this early age. It’s so much easier to learn language at very early ages. They learn colors, letters, numbers, animals. They talked about Miss Miranda, who comes in once per week, for gym, getting them active with the Play Ball! program. Happy Feet is a new program that teaches literacy while playing soccer. Pat noted that they have a big indoor space where the kids can play even in bad weather. Sr. Kathleen is their music teacher on Thursdays. They also do a Christmas pageant and spring graduation program. Pat hopes that the most popular part of the day is reading. At this age, you can’t read to them enough. You hope that they go home to talk about the stories they read and she hopes that the parents are reinforcing that with reading. 4th segment: Nicolette said their hope is to expand someday to add a kindergarten and a first and second grade. They just don’t have the space right now. Scot said he’s hearing all the time about new Catholic early education centers becoming available. Nicolette said the majority of families are sending children to school earlier and earlier. There’s more pressure on children to make sure they can do X, Y, Z by the time they’re in kindergarten. Pat doesn’t think it’s a matter of putting too much pressure on kids, but more and more parents are working and they’re wanting to get them to start socializing by the time they’re 3. Nicolette talked about scholarships for families that can’t afford the full tuition and wanting to provide the same opportunity for all children. They now have a fundraising committee of parents and every spring they have a fundraiser for the school. They discussed many of the schools that kids go to after leaving Good Shepherd. There was also discussion in how Fr. Ronan provides formation to parents and children. Nicolette said they open houses in the spring and fall, including during the day so people can get a real sense of how the school works. Part of the enrollment process is a visit including a half hour in the prospective class and seeing whether it’s a good fit for the student.